Things have definitely changed a bit with kids in this age range. 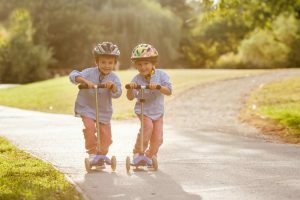 If your kid has been scooting for a while, they’ve likely developed a certain style of ride, so the best scooters for kids in the 5-8 year old range will depend on what your child enjoys more. Are they into cruising around, or are they into doing tricks at the skatepark? Don’t worry, there are excellent options here for kids who are just starting and never scooted before, too. For those kids who are heading to skateparks and doing tricks with their friends, it’s best to look for a model with some reinforcements designed to handle more rugged use. Foldable and adjustable models are not suited for jumps and tricks. The best trick scooters are designed to withstand the force of the riders’ weight as they land jumps, and are as lightweight as possible. Adjustable height scooters and folding scooters, in this case, can be dangerous. If your kid just likes to cruise around and take it to school, or practice and back, look for something with more suspension for a smoother ride. Any scooter listed here is able to take some abuse and some light tricks, just be aware of what the scooter will be mostly used for. When looking at stunt scooters, as we discussed, they need to be able to withstand significant force, or compression, read more about the different types of compression systems here. 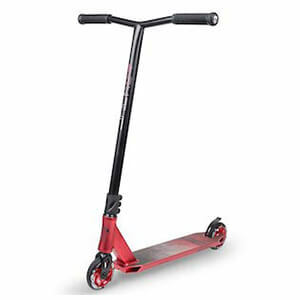 Below are our picks for the best scooters for 8 year olds, up to about 13 years old. Use the table of contents to jump to a specific model, or scroll past our quick comparison chart to view each scooter review. 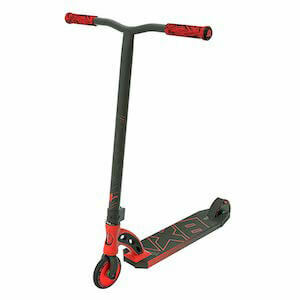 You may recognize this model from our Best Kids Scooters For 5 to 8 Year Olds list. We’ve also included it here for a few reasons, namely the quality of the build, the weight capacity of up to 220lbs means that your kid could be riding this for a long time. The ride is very smooth with larger front scooter wheels (120mm) and a smaller (100mm) rear polyurethane wheel. This provides good steering control, better front end shock absorption and decent speed. 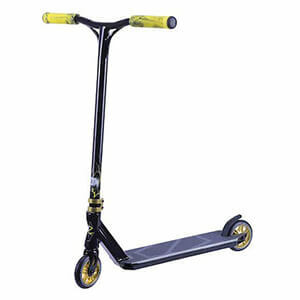 It is one of the Micro company’s top selling adjustable scooters from 22.5″ to 34″ (37″ above the ground) meaning riders should be about 4′ tall when they begin to use this model. A foldable scooter design makes travel and storage easy. One of the best things about entry level pro scooters is that manufacturers base their upgrades on the feedback they receive from team members. These sponsored pro riders are hard on their equipment and put them through rigorous practical tests. Most notably, what needs to be enforced and where. Madd Gear is no exception. They have a team of seventeen expert riders who have all had their input on the creation of this scooter, everything from the height and width of the deck, wheel size, and reenforcement of the head tube and forks. They have worked hard to become a top selling brand in the pro scooter market. The manufacturer recommends this model for 6 and up. 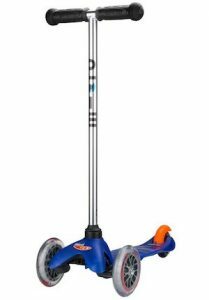 It has nice wide handle bars can handle any trick your kid can throw at it, 100mm wheels are slightly on the slow side, but lower for greater stability, which is one of the reasons this model is great for kids learning new tricks. 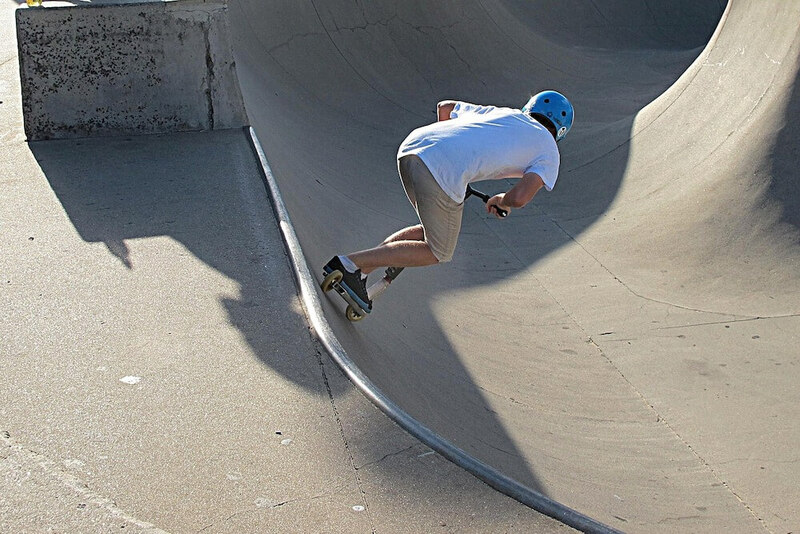 Quick and sturdy, the Fuzion Pro X-5 can take a beating at the skatepark. Probably more geared towards an intermediate trickster, but if your youngster is looking to learn tricks and really get into it, this is a great model to learn on as well. It has all the pro features to help them progress. It has 100mm scooter wheels, so the rider will get slightly less speed, but can accommodate 110mm scooter wheels for aftermarket customization. They’re very light aluminum core wheels providing excellent durability for tricks and jumps. The scooter has a solid reenforced stem and HIC compression (more about compression here). It has an aircraft grade aluminum deck for maximum strength and plush, oversized hand grips. It weighs just over 7lbs and is designed to a maximum weight capacity of 220lbs. The Vokul TRII S2 is a great scooter for kids to learn on. It performs very well at skate parks, or just cruising the neighborhood. It has a slightly lower weight capacity than the otherwise comparable Madd Gear VX7 at 140lbs (compared to MG’s 220lbs). This is due in part to the 100mm PVC core wheels, as opposed to the aluminum core wheels on the Madd Gear model. Given that it is a beginner/entry level model, depending on how aggressive you think your kid will be, they still won’t be out of place at the skatepark. It’s stable, fun to ride with easy out-of-the-box assembly with a tightening of three bolts and they’re off! Reenforced and clamped just like the experts have! Australian pro scooter company has just released the newer version of the well liked One Series Complete. 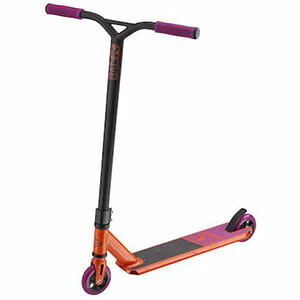 This is a version of their line of pro scooters designed for the younger rider and a good level up from the Razor scooters. The most noticeable upgrade from their original version was changing to a nylon brake (rather than metal) which is much quieter. Metal core 100mm wheels, but can accommodate up to 125mm scooter wheels for more speed and clearance. In fact, just about everything on this scooter is customizable with loads of aftermarket products. It also comes with a sticker pack so the kids can put the decals wherever they like. It features extra wide foam hand grips, a slightly wider deck (4.7″) for better stability, and their patented IHC compression (more about that here). It weighs just 7lbs and has a maximum weight capacity of 220lbs. This has most of the same features as the Fuzion Pro X-5, slightly smaller scooter wheels (98mm) providing less speed, but very light for quick tricks. Most experienced riders prefer 110mm, or even 120mm scooter wheels as they’re a bit faster but also provide more deck clearance. It has a slightly different ‘fork’ around the front wheel which team Razor says gives the scooter maximum durability, but it’s also made from aircraft grade aluminum. The Fuzion model above can take a larger wheel, the Razor here cannot due to the CNC style forks. The hand grips are rubber, most prefer foam, we’d say this model skews toward the kid looking to learn tricks rather than an intermediate ride but this it is a ‘pro’ style model. As far as pro scooters go this is definitely in the cheap kids scooter, but Razor is no joke, it’s extremely durable and a nice introduction to pro scooting. It might seem a bit early for a ‘teen’ model but it really depends on the skill level of your kid. However, it has curved handlebars, and has three adjustment settings from 35″ up to 39″ making this model rideable for anyone from 3’9″ up to 6’2″ according to the manufacturer. This is a great commuter scooter with a larger front wheel (145mm) for plenty of speed, and the smoothest possible ride. 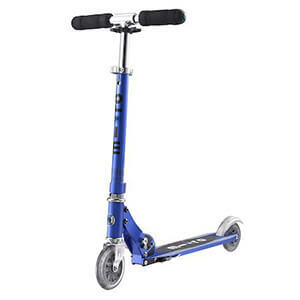 It’s one of the best scooters for teens, or soon to be teens. The weight capacity is 220lbs ensuring it will last well into their teenage years and beyond. It is easily foldable for storage and travel. This comes with a handbrake in addition to the standard rear fender brake, but also a couple of unique safety features: a bell, and reflective paint for higher visibility.